Any type of surgery comes with a risk of complications, with some having higher risks than others. Hip replacement surgery, which involves replacing a worn out, malfunctioning hip with a prosthetic, has become one of the most successful types of medical operations, with a typically low risk of hip replacement complications. A number of manufacturers design, develop, and market hip replacement systems. Most of these products have been successfully implanted in thousands of patients across the globe. Some, however, have been linked with an unusually high risk of complications like pain, immobility, premature loosening, and early hip implant failure. The first hip replacement surgery to take place in the United States was recorded as occurring at the Johns Hopkins hospital in 1940, with the procedure performed by Dr. Austin T. Moore. Since then, advancements in technology have allowed scientists to develop better and better systems that last longer, provide more flexibility for patients, and require shorter recovery times. Whereas undergoing a total hip replacement procedure used to be reserved for the senior population struggling with the damage caused by osteoarthritis, in today’s world, athletes and younger patients who have suffered from joint injuries, arthritis, and other problems are electing to go through surgery with the hopes of returning to their former active lifestyles. While manufacturers have worked to meet demand for more advanced systems, some have taken their new products to market without thorough and complete clinical testing to determine overall safety and performance. In 2005, DePuy received approval from the FDA for their new ASR hip replacement system. Like many new hip products, the ASR did not go through clinical trials prior to launch, but instead was cleared through the FDA’s 510(k) clearance program, which required only that DePuy prove the device was similar to others already on the market. A common design for hip replacement systems is a two-piece acetabular cup — the half-grapefruit-shaped part of the prosthesis that fits into the hip socket. Inside this cup, the surgeon fits a plastic liner, and then places the rounded head of the “femoral” component — also called the “ball” — into the plastic liner. The ASR was unique in that instead of the standard two-piece design, it was made of a single piece. The design did away with the plastic liner, and instead placed the metal ball of the femoral component directly into the metal acetabular cup — a design that later came to be called a “metal-on-metal” hip implant. This design allowed the ball, or “femoral head” as it’s often called, to be larger so that it would take up all the room inside the cup, in the absence of the liner. The design was supposed to make the ASR stronger, more stable, and less likely to dislocate from the hip socket. Unfortunately, patients, doctors, and scientists soon reported hip replacement complications with this device. Because of these and other problems, the manufacturer issued a DePuy ASR recall in August 2010. At the time, they acknowledged a 12 to 13 percent failure rate for the implants, which was much higher than the usual failure rates. Later studies indicated the device was failing at much higher rates. The metal-on-metal option soon started to be associated with problems remarkably similar to those linked with the DePuy ASR metal-on-metal hip implant. Friction between the metal cup and metal ball of the femoral component caused similar metal poisoning from hip replacement wear and tear. 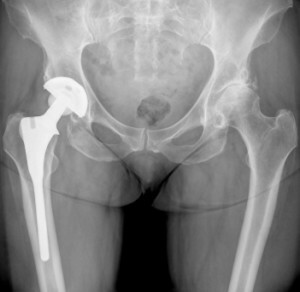 So many hip replacement complications have been associated with metal-on-metal implants that in 2012, the British Medical Journal published a feature entitled “How safe are metal-on-metal hip implants?” In the feature, scientists noted that metal ion levels high above any before-recorded levels had been reported in around 20 percent of patients with metal-on-metal prostheses, such as the DePuy Pinnacle hip system. In fact, in 2007, Dr. Lawrence Dorr, an orthopedic surgeon and Zimmer consultant, warned the company of the high rate of revision surgeries he was having to conduct in patients implanted with the Durom Cup. In 2008, the doctor wrote to the American Association of Hip and Knee Surgeons, alleging that the construction of the device was faulty, and that it was not seating properly in the hip socket and was not adhering to the bone as expected. In September 2012, the FDA sent a warning letter to Zimmer, Inc. regarding problems with the manufacturing and testing of the Zimmer Trilogy Acetabular system hip replacement devices. The agency had inspected the Ponce, Puerto Rico facility, and found that the company had no testing mechanism to show that the Trilogy products were being made to design specifications. Stryker is another leading medical technology company that has designed, developed and distributed hip implant systems. Three of these have been linked with hip replacement problems and premature implant failures. In 2007, the FDA sent the company two warning letters describing problems with manufacturing facilities in Cork, Ireland and in Mahwah, New Jersey. In the letters, they noted the company’s lack of proper response to complaints with the implant. In January 2008, Stryker issued a recall on the Trident Hemispherical Cups and the Trident Acetabular PSL Cups manufactured at the Ireland facility. The Stryker Rejuvenate and ABG hip implants were also recalled in July 2012, due to device corrosion and deterioration. Made with a unique two-piece modular stem — all metal — these implants were later found to wear against one another and deposit metal shards into the hip joint, causing metal poisoning from hip replacement wear and tear. Some Biomet M2A products were associated with problems like metal poisoning, premature loosening, and early implant failure. Wright Profemur modular neck components have been linked with reports of corrosion, fretting, metal poisoning, swelling, pseudotumors, and early hip implant failure. Wright Conserve metal-on-metal hip replacement systems, which consist of a metal ball inside a metal acetabular cup, have also been associated with metal poisoning and related complications. The Smith & Nephew Birmingham metal-on-metal resurfacing implant was associated with similar complaints of metal contamination, swelling, pain, and early implant failure. Smith & Nephew R3 Acetabular systems offered a metal-on-metal option that was recalled in June 2012 because of complications similar to other all metal implants.